This classic reference work, the best one-volume music dictionary available, has been brought completely up to date in this new edition. Combining authoritative scholarship and lucid, lively prose, the Fourth Edition of The Harvard Dictionary of Music is the essential guide for musicians, students, and everyone who appreciates music. 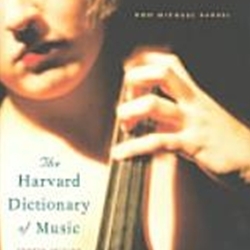 The Harvard Dictionary of Music has long been admired for its wide range as well as its reliability. This treasure trove includes entries on all the styles and forms in Western music; comprehensive articles on the music of Africa, Asia, Latin America, and the Near East; descriptions of instruments enriched by historical background; and articles that reflect today’s beat, including popular music, jazz, and rock. Throughout this Fourth Edition, existing articles have been fine-tuned and new entries added so that the dictionary fully reflects current music scholarship and recent developments in musical culture. Encyclopedia-length articles by notable experts alternate with short entries for quick reference, including definitions and identifications of works and instruments. More than 220 drawings and 250 musical examples enhance the text. This is an invaluable book that no music lover can afford to be without. © MusicMasters 2016. All Rights Reserved.